Today sees the launch of sunglasses brand Tens, bringing a fresh new idea to a market already overrun with the same options. New British designer opticians brand KITE has opened it's flagship store in Westfield Stratford, aimed at bringing a fashion-forward approach to every element of the opticians experience and industry. Oakley drop their Summer 2013 collection of Frogskin sunglasses, including a reissue from last year. Today Supreme released this season's sunglasses; the Factory and Wallace frames in various colours. Australia's AM Eyewear have teamed up with London's Other Shop (formerly B Store) to create these two frames in different styles. Introducing new British glasses band Fan Optics, the combination of the creative efforts of graphic designer Sarah Coburn and product designer Guillaume Furminger. Adding to their archive of collectors edition Frogskins, Oakley have created these Acid Tortoise variations. BAPE continue with a military inspired aesthetic on a recent collaboration with Sunpocket, a brand we've seen making a comeback recently. 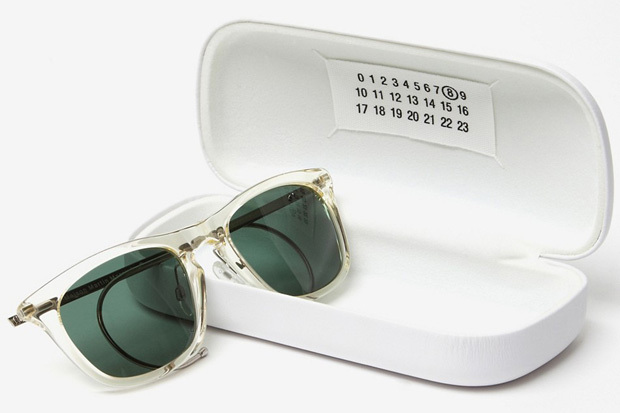 Maison Martin Margiela present these clear sunglasses from their Spring/Summer 2012 collection. SUPER continue on their path to eyewear greatness with these Tiberio sunglasses for Spring/Summer 2012. Shuron is one of the oldest names in USA manufactured sunglasses, and these Freeway frames for SS12 are superb.